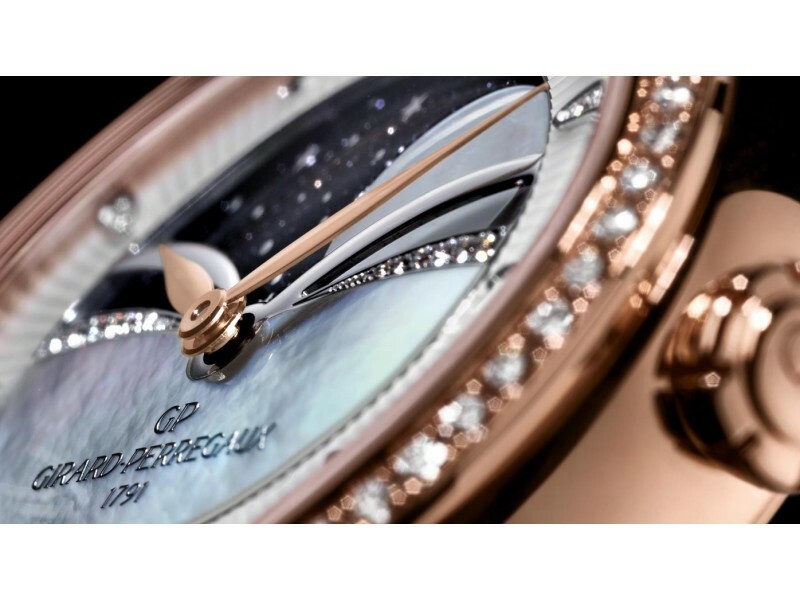 Girard-Perregaux Cat’s Eye Celestial Latest addition to the Cat’s Eye collection, the Cat’s Eye Celestial watch combines a moon phase with an elegant design and a mechanical movement reflecting the finest traditions upheld by the Maison. The iconic oval Cat’s Eye case embraces the curves of the wrist in order to adorn it like a jewel. 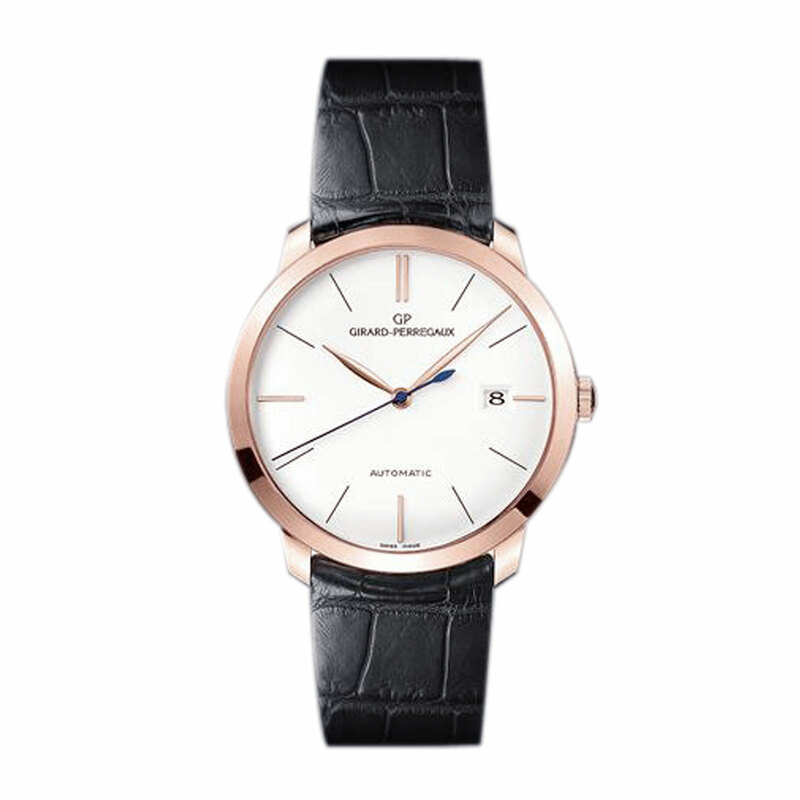 Crafted in pink gold and set with 62 brilliant-cut diamonds, it offers a guilloché hand-polished white mother-of-pearl dial. 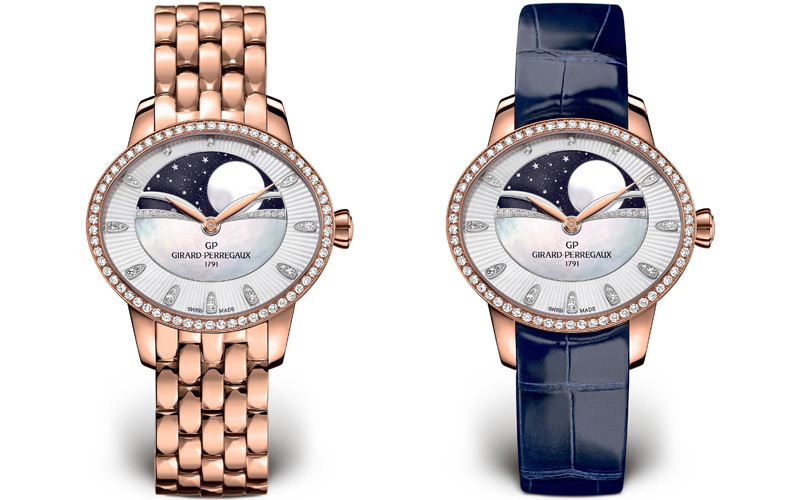 The guilloché motif, along with the gem-set drop-shaped hour-markers, draw the eye to the moon phase which occupies almost the entire dial space. Its broad 8.9 mm-diameter disc performs a full rotation in 59 days. Contrary to usual practice, the device driving the display of this complication is not linked to the arbour of the hour’s wheel, but is instead connected to the barrel and therefore moves smoothly without any jerking. Slightly domed in order to create a depth effect, the moon phase is depicted in mother-of-pearl marquetry and aventurine glass and polished by hand. The Cat’s Eye Celestial is endowed with a degree of precision testifying the high standards upheld by the Maison. A classical moon phase accumulates a one-day discrepancy every two and a half years, while the one on the Cat’s Eye Celestial requires only one correction every 360 years. This new timepiece houses a self-winding movement designed, developed and crafted by the Manufacture Girard-Perregaux, in the finest Swiss watchmaking traditions. This 240-part movement with its 46-hour power reserve is distinguished by its superb finishing, with Côtes de Genève and circular-graining adorning the main plate, blued steel screws, as well as an oscillating weight bearing a “GP” tapestry-style motif. In a supreme touch of refinement, the Cat’s Eye Celestial is fitted with a pink gold bracelet matching the case, or with a midnight blue shade alligator leather strap. 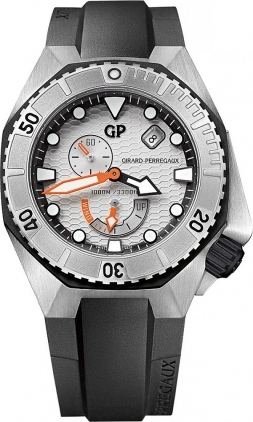 The Iconic GIRARD-PERREGAUX 1966 Collection With Steel Were Unvelied Beautiful classic Girard Perregaux men’s watch Auctions Laurent Picciotto’s personal collection goes on sale in Hong Kong WorldTempus spoke to watch retailer Laurent Picciotto about the sale of his watch collection by Phillips in association with Bacs & Russo in Hong Kong on 30th May 2017. 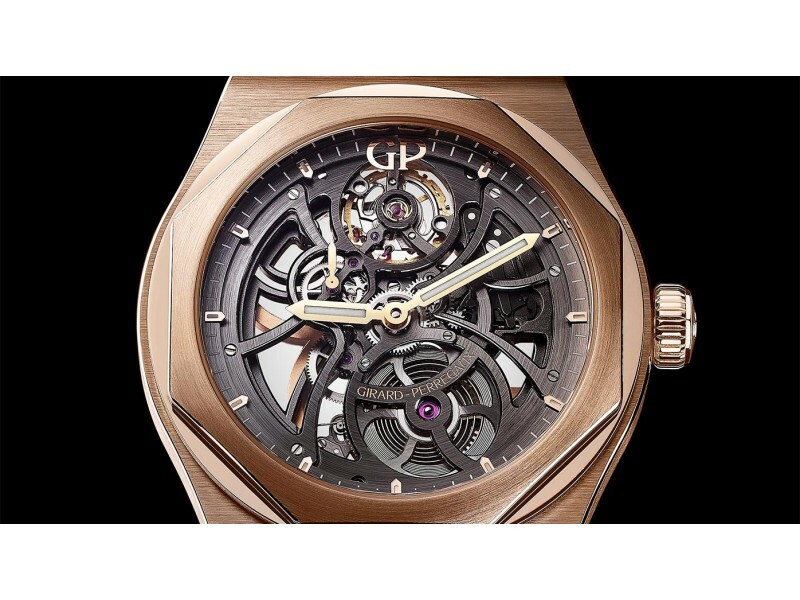 Girard Perregaux Laureato Skeleton The Skeleton had its world premiere at Les Ambassadeurs in Zurich on 27 April. 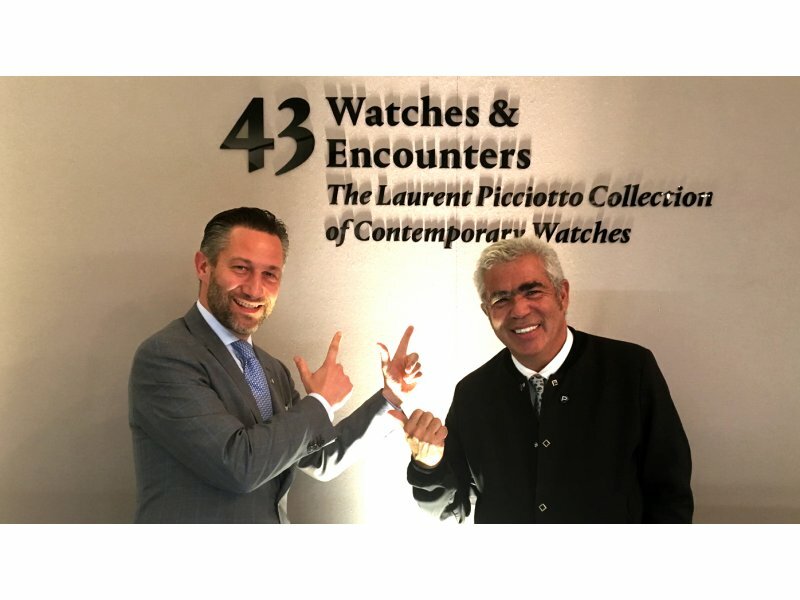 It is the latest addition to the Laureato collection, which was relaunched at the SIHH.